Operating a minimum of 15 companies at all times, including a new, state-of-the-art, double firehouse at 4300 Kennedy Blvd. in Union City that houses our Fire Dispatch Center (Fire Control), Emergency and Interoperability Command Center, and Emergency Operating Center, wherever you live in North Hudson, NHRFR has you covered. NHRFR meets or surpasses fire-safety guidelines recommended by the National Fire Protection Association (NFPA). The NFPA standard for response time is four minutes or less, while NHRFR's average response time is significantly below that standard and remains one of the best in the country. 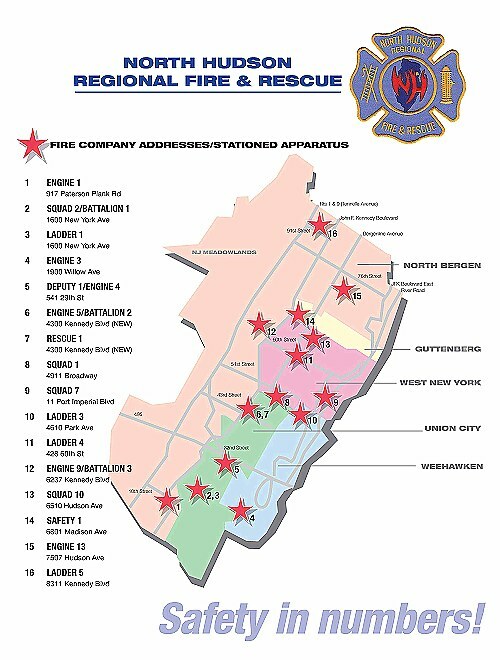 Additionally, NHRFR continues to exceed NFPA standards for proximity of firehouses.